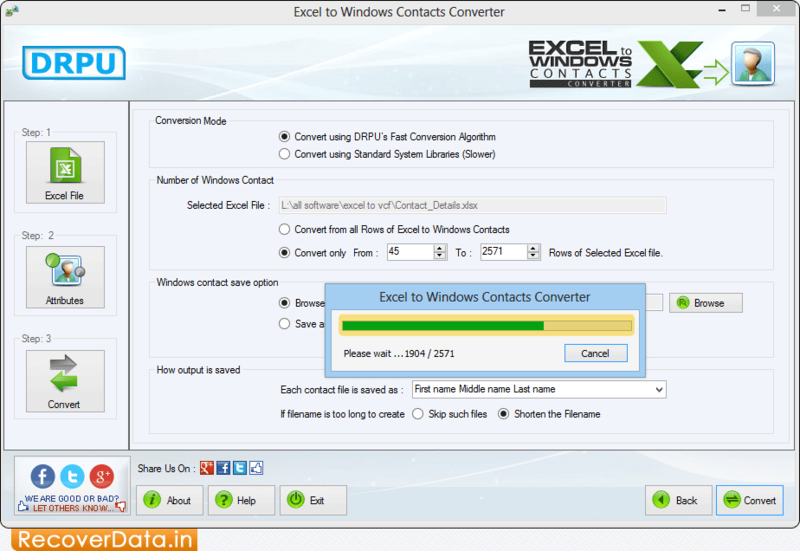 Excel to Windows Contacts Converter Software is designed to convert contacts stored in excel sheet into Windows contacts. Excel to Windows Contacts Converter program provides facility to export contacts from excel files with all information (including First Name, Last Name, Job title, Company, Email ID etc) into Windows contacts. Software provides facility to convert multiple contacts saved in excel file into Windows contacts. Software converts contacts saved in Excel file into Window contacts. Program supports all major versions of Microsoft Excel. Provides facility to export multiple contacts stored in excel spreadsheet to Windows contacts. Software supports Excel to Windows Contact conversions without installation of MS office.